Led Zeppelin were an English rock band formed in London in 1968. The group consisted of guitarist Jimmy Page, singer Robert Plant, bassist and keyboardist John Paul Jones, and drummer John Bonham. The band's heavy, guitar-driven sound has led them to be cited as one of the progenitors of heavy metal, though their unique style drew from a wide variety of influences, including blues, psychedelia, and folk music. LED ZEPPELIN T-Shirts which we offer at Plain-t-shirts.co.uk forms part of our movie, games and music official merchandise range. 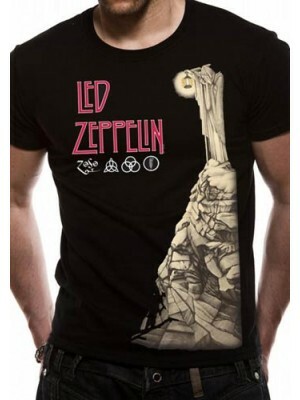 LED ZEPPELIN range we offer fast delivery all over UK/EU LED ZEPPELIN - HERMIT (UNISEX) which we offer which you can hav.. LED ZEPPELIN T-Shirts which we offer at Plain-t-shirts.co.uk forms part of our movie, games and music official merchandise range. 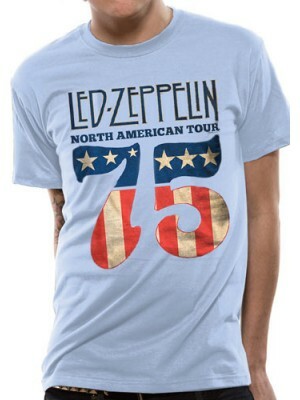 LED ZEPPELIN range we offer fast delivery all over UK/EU LED ZEPPELIN - US 75 (UNISEX) which we offer which you can have..
After changing their name from the New Yardbirds, Led Zeppelin signed a deal with Atlantic Records that afforded them considerable artistic freedom. Although the group was initially unpopular with critics, they achieved significant commercial success with albums such as Led Zeppelin (1969), Led Zeppelin II (1969), Led Zeppelin III (1970), Led Zeppelin IV (1971), Houses of the Holy (1973), and Physical Graffiti (1975). Their fourth album, which features the track "Stairway to Heaven", is among the most popular and influential works in rock music, and it helped to secure the group's popularity. Page wrote most of Led Zeppelin's music, particularly early in their career, while Plant generally supplied the lyrics. Jones' keyboard-based compositions later became central to the group's catalogue, which featured increasing experimentation. The latter half of their career saw a series of record-breaking tours that earned the group a reputation for excess and debauchery. Although they remained commercially and critically successful, their output and touring schedule were limited during the late 1970s, and the group disbanded following Bonham's death from alcohol-related asphyxia in 1980. In the decades that followed, the surviving members sporadically collaborated and participated in one-off Led Zeppelin reunions. The most successful of these was the 2007 Ahmet Ertegun Tribute Concert in London, with Jason Bonham taking his late father's place behind the drums.